Reports - Michigan Future Inc.
Michigan lags the nation in having communities that are powerful talent attractors. We are in desperate need of a placemaking vision that allows all of its regions to develop and implement their own strategies to be places where people want to live, work and play. And it needs to make sure that metro Detroit and metro Grand Rapids are able to compete with talent magnets like Chicago and Minneapolis. In our new report, we spell out why placemaking is so critical, and what we believe are the most impactful state policies to improve the attractiveness of communities across the state. 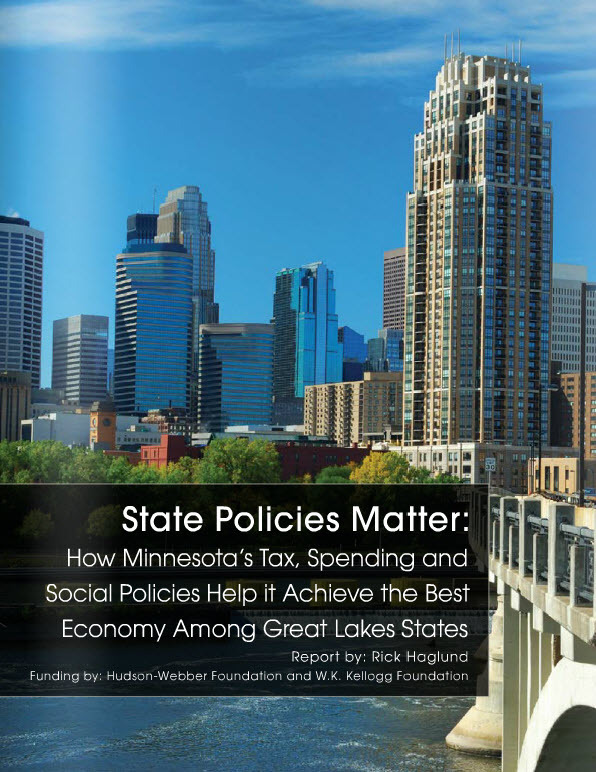 A few years ago, we released the first report in our policy series, which explored the state policies that have made Minnesota the most successful state in the Great Lakes region. We decided to go back to Minnesota again, with a similar question. How has metro Minneapolis become the 12th most prosperous major metropolitan area in the entire country? This report explores what we can learn from how metro Minneapolis drives wealth and prosperity in Minnesota. 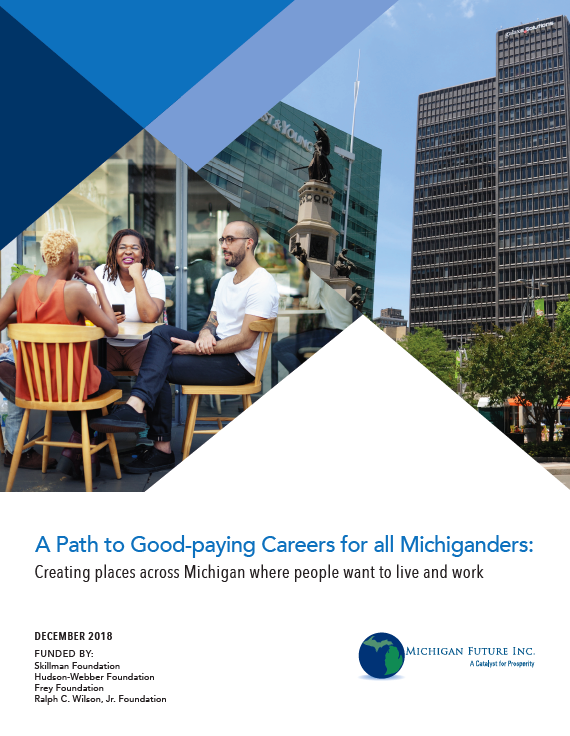 This report offers detailed ideas on how state policymakers can implement the shared prosperity recommendations in our state policy report: A Path to Good-paying Careers for all Michiganders. As with that report, our goal is to offer ideas that will engage readers in a conversation about how Michigan can meet the economic challenges of the future. 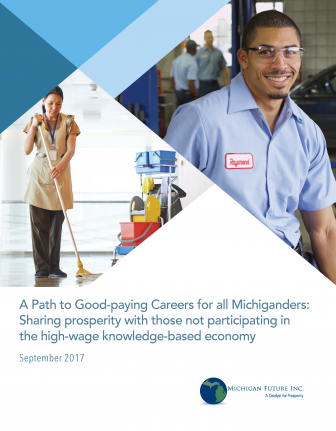 This report offers detailed ideas on how state policymakers can implement the education recommendations in our state policy report: A Path to Good-paying Careers for all Michiganders. As with that report, our goal is to offer ideas that will engage readers in a conversation about how Michigan can meet the economic challenges of the future. This report is about state policy. It is a reflection on what we have learned from 25 years of researching and writing about the national and Michigan economies. And what we have learned from two long-term human capital development projects we were involved in: The Reducing Chronic Unemployment Initiative and the Michigan Future Schools High School Accelerator. Although both provided services exclusively to residents of the City of Detroit, we believe our learnings are applicable across the state. The basic conclusion of our years of research: Michigan will not have a mass middle class again until we transition to the knowledge economy that is the path to prosperity in the 21st Century. This report lays out a state policy agenda designed to connect people to a career of good-paying work in the context of an economy constantly being reshaped, largely by technology. Click here to read the education report. Click here to read the shared prosperity report. The Ralph C. Wilson Jr. Foundation (RCWJF), in partnership with Michigan Future, hired ROI Insight to design and execute a multi-modal study exploring current factors impacting workers’ earning power and career success. Utilizing a series of 8 open ended focus groups, this report follows the paths of individuals without college degrees making an annual income of at least $40,000. Incorporating both qualitative and quantitative methodologies, the primary objective of this report is to gain an understanding of how focus group participants achieved successful careers and how their experiences can inform policy and investment decisions. Expanding on research conducted in ROI’s Qualitative Research report, this report seeks to quantify how market characteristics, perceptions, pathways, practices or experiences impact earning power and career success for workers without college degrees. The primary goal of the report is to learn what experiences and best practices led to and bolstered career success for these individuals and how future decisions can influence these trends. CLICK to read the executive summary. 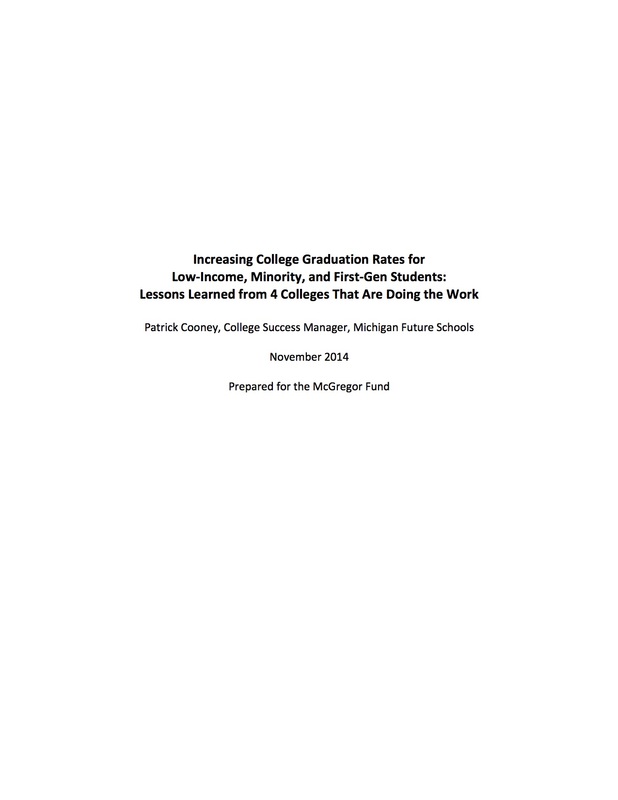 Michigan Future School’s report takes a hard look at the colleges that have done well at making deliberate efforts to make student retention, success, and graduation a focus for their low-income, minority, and first-generation students. Specifically, the report looks at Georgia State University, a large, comprehensive urban research university, with demographics strikingly similar to Wayne State, that has improved graduation rates by 22 percentage points over the past decade, while eliminating the graduation gap between underrepresented minority and white students. CLICK to download a PDF version of the report. Michigan Future’s latest report looks at Minnesota, the most prosperous state in the region with the lowest unemployment rate, and the public policies that have helped it achieve that status. Michigan Future has long argued that our state should want a high income, low unemployment economy that looks like Minnesota. Now we know how policymakers steered the state into that position. 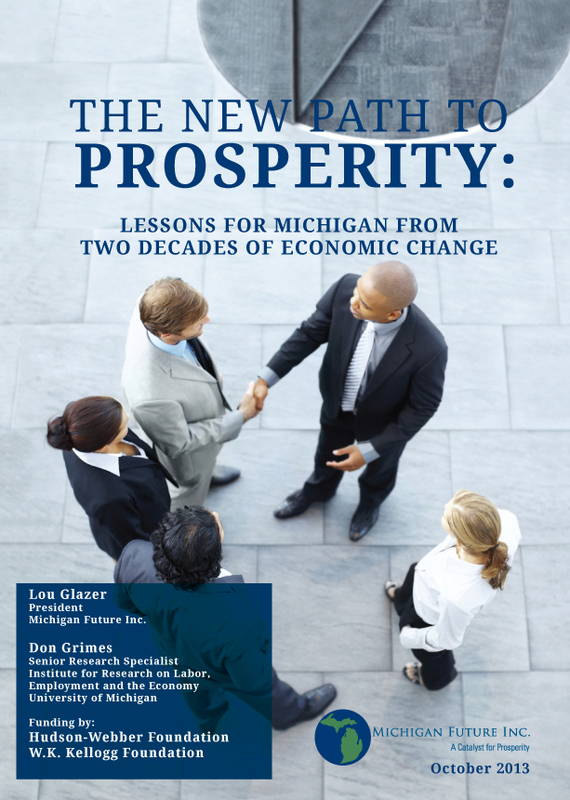 Michigan Future’s latest report examining how Michigan can return to prosperity reviews the changing patterns of employment and private sector income from 1990 to 2011 in the United States, Michigan and Minnesota. The lesson Michigan needs to learn is clear: The places that are doing best today and almost certainly will do the best in the the future are those states and regions that are concentrated in knowledge-based services, not factories. Michigan continues to have difficulty transitioning to a knowledge based economy which has led to Michigan getting poorer compared to the country. 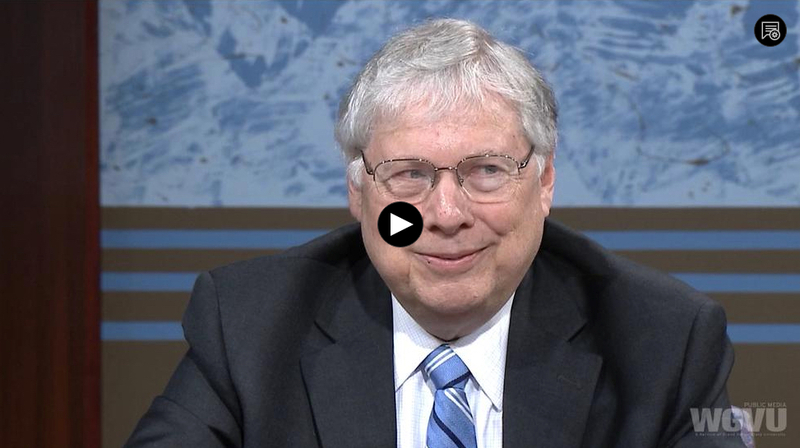 In Michigan Future’s fifth annual report on Michigan’s transition, Lou Glazer and Don Grimes detail which states and metropolitan areas are doing the best and why. As we detailed in our 2006 A New Agenda for a New Michigan report, Michigan’s decline is caused, in large part, because Michigan – its citizens, enterprises and communities – has been slow to adapt to a rapidly changing global economy. Today, leading-edge communities are leaving behind the Industrial Age. They are adapting quicker and better to a more knowledge-driven and entrepreneurial economy: the flat world. This report details what has happened to the national and state economy over the past decade. As well as details on what states and metropolitan areas are doing the best and why. From its inception Michigan Future Schools understood that the schools it invests in need to be good at operations, academics and student recruitment. All three matter. That in addition to financial support, MFS needed to help the schools it invests in build the capacity to be first rate in all three areas.When it came to designing student recruitment assistance, we found that no one had done the basic research on how Detroit parents chose the schools they enrolled their children in. When we looked nationally for that kind of research, we couldn’t find it either. That is the genesis of this report: Doing the basic research to better understand Detroit parents as shoppers for k-12 schools. Given the absence of this basic research, we decided to focus on all students, not just high school students. 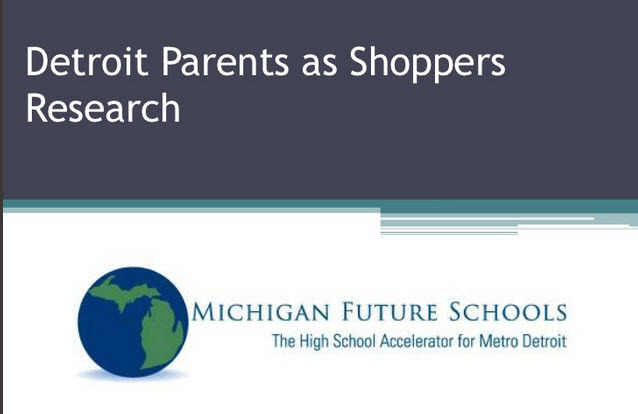 To do the research we assembled a team of national and state leaders in researching urban parents as school shoppers and conducting household surveys. They worked very hard to ensure that the sample is representative of Detroit households with school are children. The research was conducted in the spring/summer of 2011. The resulting report provides a descriptive profile of the school shopping behavior of 1,073 Detroit households with 1,699 school-age children. Based on doorstep interviews and focus group discussions with these families, the report represents one of the most comprehensive and aggressive attempts nationally to answer important questions about how parents, especially low-wealth families, think about and pursue school options within a major urban setting. The report also provides rich descriptions of how four different school shopper types approach the school search and selection process. 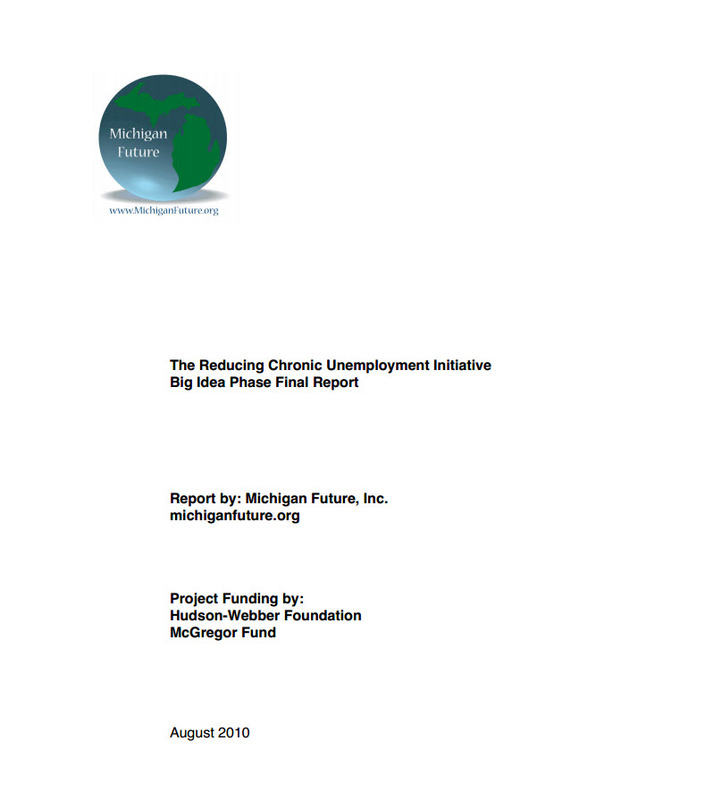 Final report on an eight year project to find better ways to connect chronically unemployed Detroiters to stable employment. Including the results of an independent evaluation of the initiative by the Upjohn Institute. Foundation funding provided by the Hudson-Webber Foundation and the McGregor Fund. 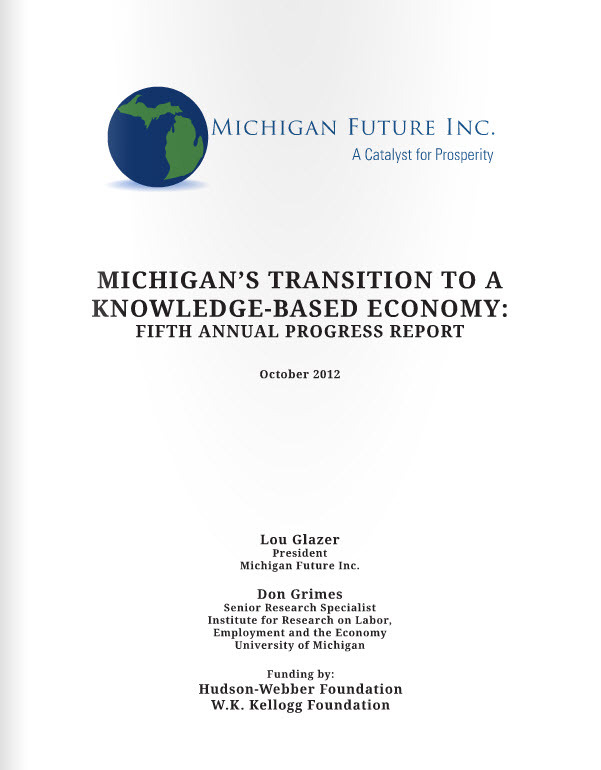 The annual progress report from the 2006 “New Agenda for a New Michigan Report” that focuses on Michigan’s transition into a knowledge-based economy. This report covers the picture of the national economic expansion from 2001 to 2007 and the results show that trends impacting Michigan are accelerating. In particular, low education attainment industries have suffered the greatest job losses while high education attainment industries have added jobs. The progress report further reinforces the need to increase the concentration of educated talent and the reality that the Michigan prosperity of the past of good paying low skill jobs is no longer a viable path. A follow-up report to the New Agenda for a New Michigan report to identify where young professionals are concentrating in the Great Lakes, with a focus on young college graduates – they are the most mobile and since talent becomes less mobile with age, the most critical to attract. The report finds that young professionals are concentrating in metros all over the country however that Michigan metros (Detroit and Grand Rapids) have fewer young professionals proportionally than in Chicago or Minneapolis. In fact, metro Detroit would need an additional 140,000 young professionals and Grand Rapids an additional 35,000 to be proportionally comparable. Lansing also lags behind Madison. The report further reinforces the importance of having a prosperous central cities if we want to have a prosperous Michigan. In collaboration with a University of Michigan MBA Map Project Team, this report provides recommendations for how Detroit can become a more attractive place to live for young talent. Using focus groups, field research, in-depth interviews, surveys, and third party research, the project team identified the specific housing characteristics and neighborhood attributes that appeal to the Millennial Knowledge Workers. The report pays particular attention to successful areas within Chicago and then provides an analysis of the current state in Detroit and recommendations for improvement. Among the findings, the report shows that Millennial Knowledge Workers have a strong preference for urban walkability, value neighborhood amenities more than housing amenities, and want variety, density, and opportunities to socialize. The report also finds that Detroit suffers key perception challenges, in particular with crime, and these perceptions are often misperceptions. The key recommendations include creating critical mass in non-chain dining and retail, increase lighting and enforce noise abatement laws to create feelings of safety, improve delivery of public services in particular for small businesses, promote a message of hope and opportunity, and leverage existing assets such as the music scence, architecture, and cultural areas. 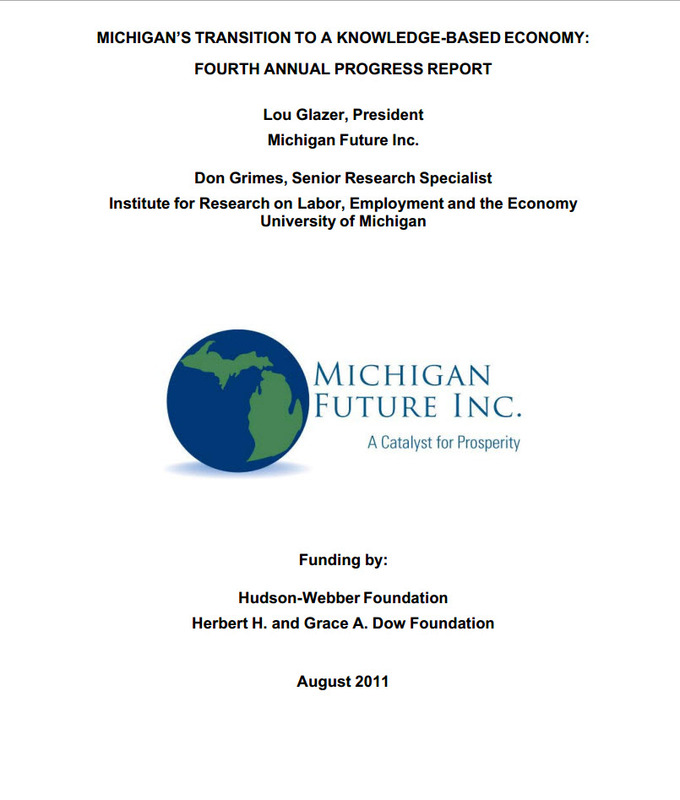 The annual progress report from the 2006 “New Agenda for a New Michigan Report” that focuses on Michigan’s transition into a knowledge-based economy. Following an unprecedented seven years of consecutive job losses, Michigan is now moving towards the bottom of national rankings in both employment and per capita income. In this report, we found that states with the highest per capita income are overconcentrated in knowledge-based industries and have a higher proportion of adults with a four year degree or more. Even more, the most successful states have a big metropolitan area with a higher per capita income and higher portion of residents with a four year degree than their state. Michigan has declined for 6 straight years in employment (2000-2006), even during three years of an upturn, and is below the national average now in per capita income. The key cause is that Michigan has been slow to adapt to a rapidly changing global economy and the path forward will require concentrating in knowledge-based enterprises that are seeing the fastest growth and the highest pay. To do this, Michigan Future Inc. recommends building a culture that is aligned with a flat world that values learning, entrepreneurship, and diversity. It means investing in higher education first and foremost with recommendations to give autonomy to public institutions of higher learning, match federal research dollars with state funding, and fund students rather than institutions. It will also requires an ability to attract talent, which means building regions that are attractive places to live and have vibrant central city neighborhoods and right level of infrastructure (which now means advanced connections to internet, international airports, and green infrastructure). The path forward also includes an increased focus on attracting export-based business investment, aligning k-12 education with a knowledge-driven economy, and having strong civic, business, and political leadership. The steep decline in manufacturing jobs is viewed with greater concern than job losses in other industries on the belief that it is an irreplaceable mass pathway to the middle class and a driver of economic growth. This reports looks at the validity of these concerns – are other industries providing pathways to middle class jobs and are manufacturing concentrations correlated with strong state economies and if not, what industries are powering the most prosperous states. The report compares manufacturing, as defined by the nation’s new industrial classification system, as work done in factories, to knowledge-based industries at the state level and finds that these concerns do not hold. In fact, almost across the board, states with a higher concentration of manufacturing have below average income per capita and states with higher concentrations of knowledge-based jobs are above average. A collection of experienced and insightful urban practitioners and policy analysts came together to make the case that central cities are important to Michigan’s future and offer a framework for action. The report argues that central cities are important because they connect people to opportunity, attractive the creative class, serve as historical and cultural centers, and are the place where society confronts and reduces poverty. The report reviews challenges that Michigan faces in creating vibrant central cities and offers an agenda, with policy recommendations, based on the following 4 commitments: a commitment to be welcoming to all, a commitment to provide quality public services, a commitment to be development friendly, and a commitment to deconcentrate poverty. From 1991 to 2002, the Michigan economy boomed, along with but at a greater pace, than the national economy. The aim of this report to review the data from this period to identify trends that are likely to be influential in the future. The report looks at population growth by age as a determinant of labor pool size, growth in the labor force, the proportion of full-time/part-time workers, employment earnings by education, employment by industry, and employment by occupation. The report finds that structural labor shortages due to an aging population with slow population growth are likely to be the rule rather than the exception going forward. In addition, the report finds that during boom times those with the highest education saw the greatest increase in wages and the economy is being increasingly focused on offices, schools, and hospitals. The automotive industry still matters for Michigan as do low age industries that account for nearly 1/3 of Michigan workers. The key goal of this report is to identify pathways for people to attain good paying jobs without a four-year degree. Using focus groups and telephone surveys for individuals without a college degree who were making above $30K per year (both in inner city Detroit and Metro Detroit), the study focuses on the types of jobs, how they were discovered, and the skills and training needed for them. The reports finds that for this population the career path is ad-hoc (think rock climbing) rather than a linear well-defined job ladder. It also shows a greater diversity of pathways – technical training programs and unionization were minority pathways. The skills needed for the job were mostly learned on the job and the real skill is in having perseverance and resourcefulness to find promotion opportunities and get the skills for that promotion on your own. The report recommends a career preparation system based on how people are actually succeeded (how to be successful in an ad hoc career path) and that is more employer centered (since that is where they learn the skills) than institution centered. It also questions the strategy for technical training programs, but still encourages them when people are ready for them, which tends to be in their 20s after they have decided not to pursue a four-year degree rather than in high school. Michigan’s economy is booming with record low unemployment, income is rising for the first time in two decades, and employers have trouble finding qualified people in the war for talent. But, despite this climate of economic vibrance, unemployment remains high in urban Michigan. This report is designed to develop workable policies that lead to economic self-sufficiency for urban poor through helping urban adults find work. The study finds that just because the economy is providing increasing opportunities it does not mean the urban poor are able to connect to them. The path to economic self-sufficiency is through the regional (rather than local) labor market and having the skills to compete for jobs at the regional level. A key barrier to acquisition of skills are the effects of concentrated poverty. The recommended policy interventions include deconcentrating poverty, enhancing early childhood development, transforming urban K-12, reducing economic segregation in housing and schooling, and investing in training for the chronically unemployed.